The House of Representatives passed a short-term funding patch for the Highway Trust Fund (HTF) July 15. The bill provides $10.8 billion to the HTF, sufficient to support the current spending levels of both the Highway and Mass Transit Accounts through May 31, 2015. Additionally, the legislation extends the authorizations for the federal highway and transit program through the same date. The Senate is expected to vote on the House’s legislation, and two other options, as soon as next week. For more details, see APTA's Legislative Alert. To keep the pressure on Congressional action on the HTF "fix," APTA and more than 60 organizations sent a letter to Congress July 14 urging members to pass legislation stabilizing the HTF and preventing a shutdown of public transit and road investments and infrastructure projects across America. Signatories representing every sector of the economy agreed, "our transportation infrastructure network is the foundation on which the nation’s economy functions." APTA also announced its survey detailing the impact to public transit systems if the HTF and Mass Transit Account issues are not resolved. Also in Washington, DC, this week President Obama's Council of Economic Advisers released a report showing the long-term economic benefits of public transportation investment and concluding that conditions in the infrastructure sector are ripe for innovation, with new technologies and approaches promising significant gains in productivity, efficiency, and resilience. 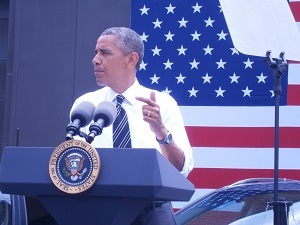 President Obama launched the Build America Initiative July 17, designed to increase public transportation investment by expanding public-private partnerships and putting DOT's credit programs to greater use. APTA President & CEO Michael Melaniphy praised the plan, saying, "This innovative financing initiative is another tool in the investment toolbox as the transportation industry works to address our significant infrastructure needs." Riding public transit saves individuals an average of more than $846 this month and $10,140 annually, according to APTA's latest Transit Savings Report. These savings are based on the cost of commuting by public transportation compared to the cost of owning and driving a vehicle and includes the July 16 average national gas price. Early-bird registration is now open for the 2014 APTA Annual Meeting & EXPO, Oct. 12-15, in Houston. The industry's premier event will feature first-rate speakers, more than 750 exhibitors, and sessions focused on vital public transit issues. See the upcoming special Annual Meeting & EXPO issue of Passenger Transport for more details. Congress needs to raise the gas tax to fund public transit, writes the New York Times. Kansas Citians say investing in public transit is their top city priority, a new poll finds. A woman in Albany, NY, who needs a new kidney is soliciting donors by advertising on Capital District Transportation Authority buses.